The 2018 Omaha Ambassadors Forum was engaging and trans-formative, thanks to a partnership between International Programs, Burlington International Group, and the American Academy of Diplomacy. Four former U.S. 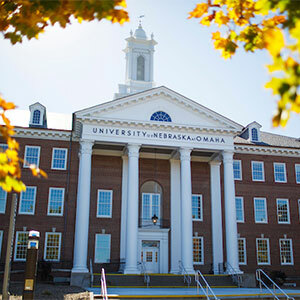 Ambassadors visited campus for the 2018 Omaha Ambassadors Forum. From left: Susan L. Ziadeh, former ambassador to Qatar; James F. Collins, former ambassador to the Russian Federation; Earl A. Wayne, former ambassador to Argentina and Mexico; and Deborah A. McCarthy, former ambassador to Lithuania. There are 195 countries in the world and each has history, culture and politics all their own. However, through international relations and diplomacy, many countries are able to work together for the common good. Wednesday, April 4, marked the 8th Annual Omaha Ambassador’s Forum, a public panel discussion featuring four former U.S. ambassadors with a combined century’s worth of diplomatic experience across four presidential administrations. 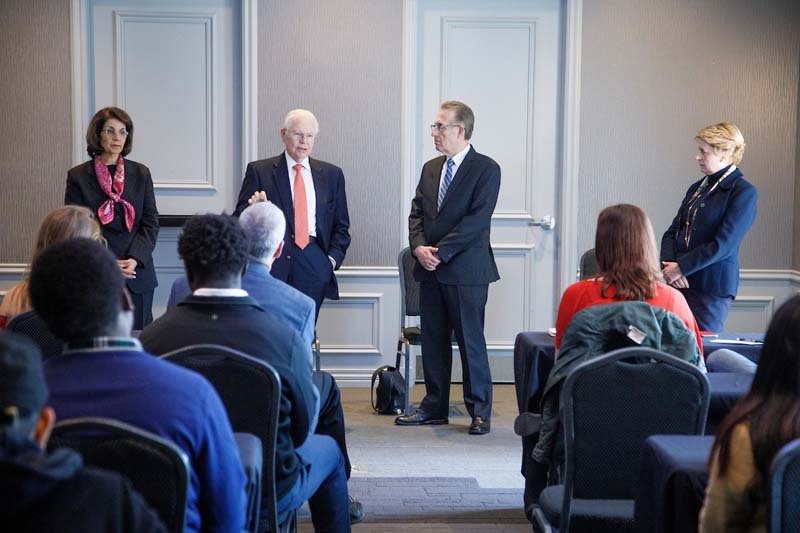 The visiting ambassadors included James F. Collins, former ambassador to the Russian Federation; Earl A. Wayne, former ambassador to Argentina and Mexico; Susan L. Ziadeh, former ambassador to Qatar; and Deborah A. McCarthy, former ambassador to Lithuania. The panel was moderated by Tom Gouttierre, dean emeritus of International Studies and Programs at UNO. The event, organized by UNO and the Burlington Capital Group, welcomed approximately 100 people to the Thompson Alumni Center, including two groups of students from Central High School and Marian High School, as well as visiting students from southeast Asia as part of the Young Southeast Asia Leadership Initiative (YSEALI). “As ambassadors, we believe that you if you don’t engage in a multigenerational way and encourage both understanding of the global context and also encourage people to think of public service – not necessarily diplomatic service, but it could be military, it could be in the intelligence community – we are not attracting the best and the brightest,” explained McCarthy. While the topics for the forum were wide-ranging, the focus was on current international issues facing President Trump, ranging from a strained relationship with Russia, tariffs recently imposed by China and how to confront terrorism, namely agents within Al Qaeda and ISIS. Many questions were also raised by the audience, including the impact of China’s decision to eliminate term limits for elected officials, the current humanitarian crisis in Venezuela, the recent changing of the U.S. embassy in Israel to Jerusalem and the role of energy in ongoing trade policy. Following the public forum, each of the ambassadors spoke personally with a small group of students made of YSEALI participants, UNO students and high school students. McCarthy said having such a wide range of diverse attendees was important to the future of diplomacy both nationally and internationally.